The digital car key can help you lock, open your cards, and warm you when someone is trying to steal or scrap your car, and this poker cheating scanner car key can help you win in the poker game. How it helps you win? An electron scanning camera is built inside the car key, you can turn it off and on at any time. 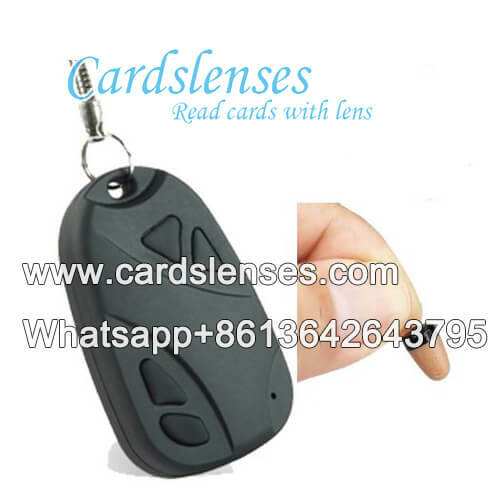 When you want to use it, you just need to put it facing to the edge marked barcode playing cards, and after it scans the cards, it will send the scanning image to the poker predictor to analyze the barcode image, and finally, the poker predictor will inform you the winner by a pair of tiny receiving earpiece. You can set the rules that only tell you the first winner or all ranks of the poker players. It depends on your need. The battery life of this car key cheating scanner is about 2 hours, and if the battery is running out off, you can exchange it. The battery for this car key digital scanner has a small volume that it is really easy and convenient to take it.